I remember once being up on Great Gnats Head when a rather bemused gentleman came over with map in hand and more frowning furrows on his forehead than there were contour lines on the map. It transpired that he was rather concerned because he could not find the Abbot’s Way which was marked on the map. When asked what he was trying to find he replied in a very exasperated way, ‘the track which is shown on my map’. I tried to explain that it was only representational and there was as such no physical track but he was having none of it, ‘no, it’s clearly marked on the map’, he snapped. Yeah, so is the M5 motorway so why not try walking along that instead! So what was the guy looking for? In theory he was trying to find one of the trans-moorland tracks which was used by the medieval monks when travelling between the monastic houses of Buckfast, Tavistock, Plympton and Buckland. 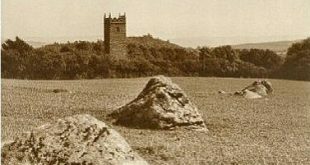 If you would like a quick detour into the realms of Dartmoor legend to find the supposed origins of The Abbot’s Way then click – HERE. ‘Of the thoroughfare that for several hundred years witnessed colourful pageantry of Medieval life, the lordly progress of the Abbot with his retinue, the hunting knight and his retainers in pursuit of the Red Deer, the passage of merchandise, and the processions of pilgrims on their way to and from the shrine of Our Lady of Buckfast, fragments alone remain today.’, (Dysart, 1935, p.13). Although not actually stating the fact, Dysart has admirably shown the allure of the ancient trackway, he has also pointed to it’s origins. There can be no question that such a track existed, in fact there were probably three, however there is a big question as to the name and the origins. If you look at Benjamin Donn’s 1765 map of Devon there are several trans-moorland tracks shown but no mention of The Abbot’s Way. Likewise there is no mention of The Abbot’s Way on the 1809 Ordnance Survey map. So does this mean that the tracks never existed or simply that the name is a modern invention? To answer this question we need to look at the facts. 1) There were monastic abbeys at Buckfast, Tavistock, Buckland and a priory at Plympton. 2) Buckfast and Buckland were Cistercian houses. 3) There would have been many occasions when communication needed to be made between the abbeys. 4) Cistercian’s were renown for their agricultural expertise and trade which would have necessitated the transportation of their produce. 5) Alongside the monastic need for communication was the various flourishing secular trades which in necessitated the need for trans-moorland travel. The big question now is which came first, the secular trans-moor routes or the monastic ways? William Crossing (1990, p.47) tells us that: ‘On the moor this old way (The Abbot’s Way) is usually called Jobbers’ Path, or, as the moormen have it, Joblers Path.’. Hannigan, (1997, p.154) has much the same opinion when he remarks: ‘The route was dubbed the ‘Abbot’s Way’ in the nineteenth century, though there are earlier records of its being named simply the ‘Jobber’s Way‘. Hindle, (2001, p.47) is even more enlightening when he informs us that: ‘the track (Abbot’s Way) is certainly older than the abbeys, and although the monks no doubt used it, it was always known as the Jobbers’ Path or Cawse until a traveller called John Andrews first dubbed it the Abbot’s Way in 1794.’. I would further suggest that the Jobber’s Cawse itself mimicked the route of a much earlier track, probably dating back the prehistoric times. Peel, (1982, p.78) thinks along the same lines when he says: ‘That the monks themselves created the entire route is unlikely, because Bronze Age folk had dwelt beside it, and the monks probably followed some of those ancient tracks, treading new ones to fill a gap.’. So there it is, there was no such thing as The Abbot’s Way until 1794 and if monastic travellers walked along anything it was the Jobbers’ Path/Cawse and in case anyone is wondering, a Jobber/Jobler is a term used to describe men who bought wool and woven cloth. The wool would be purchased from the various farms and monastic houses and then sold it to spinners on the moorland edges. In some cases they would then buy back the finished woven cloth and trade it on. The Joblers would carry their loads across the moor on trains of pack animals, once established, their routes would soon become well worn and easily detectable, (Hemery, 1983, p.55). Hopefully this will have cleared up any misconception of the Abbot’s Way being an entire and ancient trans-moor track in its own right. ‘The records of Buckfast Abbey show that the monks in general came from homes distant from Dartmoor; they would therefore not have possessed either the geographical knowledge or the intuitive topographical sense of the native… The route marked ‘Abbot’s Way’ on Ordnance maps, and consequently adopted by many writers and dependent bodies, was drastically unsuited to monastic travel, and that convincing evidence now exists to show that Track 12 (Monastic Way: Buckfast – Tavistock) was the authentic route. To avoid the confusion surrounding the subject of moorland monastic routes, I have dispensed altogether with the term ‘Abbot’s Way’ – which is in any case unhistoric…‘. Dysart, G. 1935. The Abbot’s Way, Bristol: The Burleigh Press. Hannigan, D. 1997. Historic Tracks, London Pavilion Books Ltd.
Hemery, E. 1986. Walking Dartmoor’s Ancient Tracks, London: Robert Hale. Hemery, E. 1983. High Dartmoor, London: Robert Hale. Hindle, P. 2001. Roads and Tracks for Historians, Chichester: Philimore & Co. Ltd.
Peel, J. H. B. 1982. Along the Green Roads of Britain: Newton Abbot: David & Charles. Just walked the first three miles of the Abbot’s Way and have looked it up in my original 1765 Donn’s map of Devon. As mentioned, no sign of the AW in Donn’s day. Good to look at Donn’s maps again though!